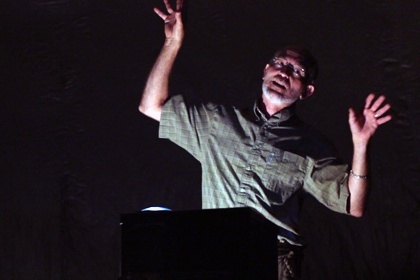 SkyDome Planetarium has been our most popular school assembly program of all time for a reason: it's awesome! 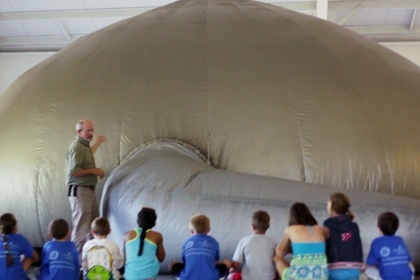 The standard in portable field trips, SkyDome takes your whole school through the solar system, to the stars, and back again. Ryan Thompson blasts you off on this cosmic journey in this short video. Even though the SkyDome Planetarium is huge (36 feet in diameter and 15 feet tall), it still fits within most gyms and multipurpose rooms. In California where gym space can be limited, we offer a smaller dome that can fit inside a large classroom. The presentation itself covers all of the planets in our solar system (even Pluto and the other dwarf planets), discussion of the space program, constellations, Greek mythology, and even black holes. Of course, the presentation is tailored for different grade levels (K-8) so nobody is overwhelmed by information, only by the experience. Our teachers gear the content of each presentation for the appropriate grade level. Take your whole school on a field trip...without leaving your school. If you're interested in bringing the SkyDome Planetarium to your location, please take a look at this page for lots of information, or just give us a call at 800-433-7459 and speak with your regional manager.